Brainstorms Can Bring You BONANZAS! DO YOU know how to build a secret ray gun for 2c? Can you design, develop and produce a treasure-seeker or mine detector that will cost only a nickel? 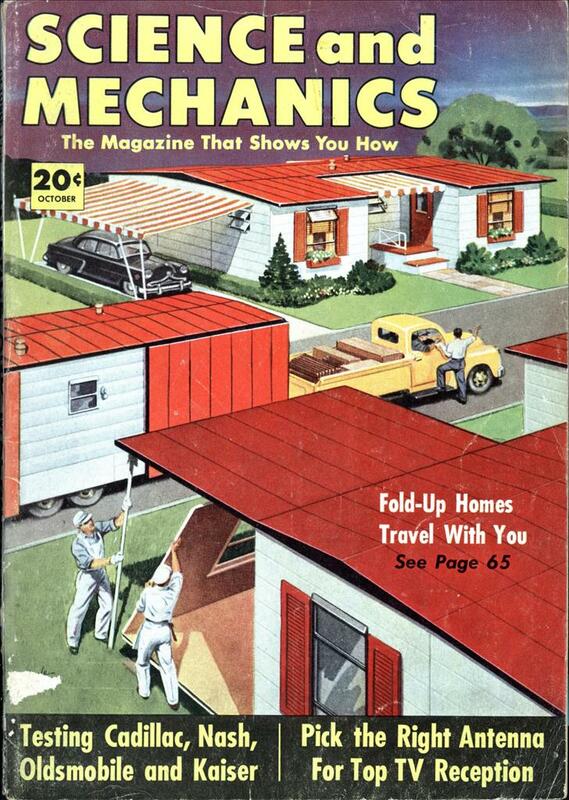 Or build a radar or television set that sells for a dime? Perhaps you could handle an assignment to design a jet plane—sale price 5c—that really flies? Or, how about those other bright ideas for trick gadgets and paper toys sailing around in your noggin! The market is ripe for these gimmicks. Ask the man who has made a name and a nice pile of cash thinking up such items—aeronautical engineer Adam Stolzenberger, of Knollwood, Ohio. He will tell you that, in the last five years, four of these trick items have netted him upwards of $10,000, and the profits are still rolling in from the royalties. Right now he has several new surprises ready for the market, because he wants to keep moving with this spare-time hobby, which has turned into such a dollar-maker. His success formula is simple – get a good catchy idea, make it economically and make it work, build a model of it and then let the item sell itself. Sounds easy, but let’s visit with him a bit and find out just how he makes this formula pay off. When you enter the Stolzenberger home, you might hear a fluttering noise that sounds like a parakeet flapping about the room. That’s “Flappy,” the toy mechanical bird (or ornithopter). General Foods bought that one and for 10c and a boxtop, the nation’s youngsters received a bird that really flew. Attached to the radio loudspeaker in this inventor’s home are boy and girl miniatures in gay colorful costumes doing the rumba to the music of Xavier Cugat! We’ll tell you the secret of how they follow the rhythm later. Where do the ideas come from? Let’s take a look at how the 5c jet plane came into being. Stolzenberger saw a couple of teen-agers battling with soda straws. They shot each other by blowing the protective paper coverings off the straws. Stolzenberger applied the principle to his toy jet plane. First, he sketched and cut out a plan-view of a jet fighter on cardboard. 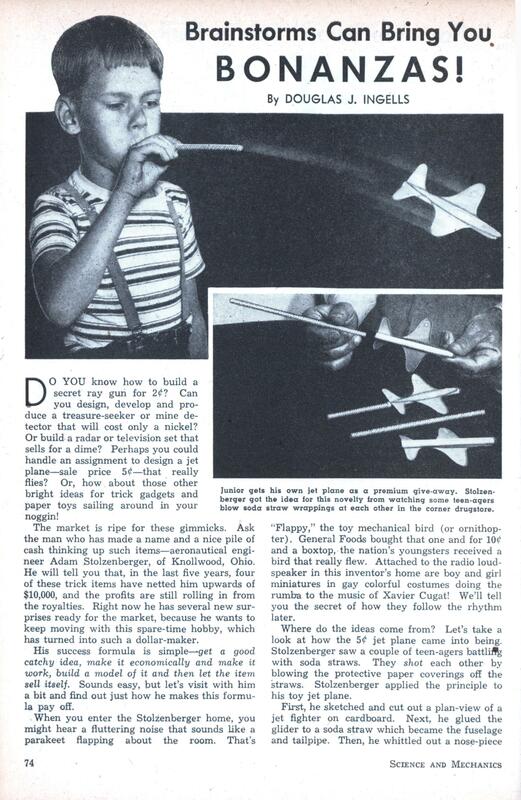 Next, he glued the glider to a soda straw which became the fuselage and tailpipe. Then, he whittled out a nose-piece shaped like a bullet and plugged up one end of the tube-fuselage. He slipped the fuselage over another straw, smaller in diameter, like a glove fits over a finger. The rest was a breeze, the huff and puff you blow into the straw. A novelty manufacturing concern bought it and produced it so cheaply that it became a popular premium item for a big Chicago milk company. Here’s another gem of advice. For a long time Stolzenberger dreamed up large things. He even drew up plans for an all-purpose pleasure plane, an amphibian yacht, and made a successful working model that won him a national contest for unusual design. But prospective backers shook their heads. It would cost hundreds of thousands of dollars to build; there would be little demand for it; and there was already too much competition in the field of such designs. The toy flapping wing bird is strictly an impulse item and also Stolzenberger’s most handsome royalty-check writer to date. The first check he got for Floppy totaled $1400. He’s had several since, and it’s still selling. He went to work on it the next day, but it wasn’t so simple. Mankind for centuries had been trying to duplicate the flight of birds both in model machines and full-sized flying machines. Stolzenberger soon learned these cold, discouraging facts. He read books on bird flight and here and there he successfully pecked up some ideas. He learned you could get flapping-wing motion using a series of push-rods, cams and a nightmare of gears. Some ideas worked, but the result was like clapping your hands. It made a noise, but ‘it didn’t produce any sustained flight. Stolzenberger was ready to give the whole idea the bird when he recalled that one time he was up in a glider and suddenly a strange flutter occurred in the tail. Some other part of the glider had gone into similar vibration and the two parts went into resonance. If resonant frequencies could activate motion, he reasoned, why not make them work? Maybe you could flap a bird’s wings that way. After two days and two nights of continuous experiments and 252 paper models, he found out you could. First, wire was bent to shape like a bird’s wings then covered with tissue which had a feathered design to make it look bird-like. The frame was nothing but piano wire, stiff enough to hold its bird profile shape, yet flexible enough to permit bending to change the airfoil to permit climbing, diving, looping. An unbalanced rotor was shaped like a bird’s head and beak. The rubber band joined the wings and the body. You “wound up” the bird’s-head (rotor) like you would a propeller. Then, you let it go. When it unwound, with a little whirring noise, its spinning set up the desired frequency. It transmitted this vibration to the piano-wire skeleton of the same frequency. Thus excited, the frame—in resonance with the rotor— flapped the wings to large amplitudes. Though it’s just a toy, Stolzenberger’s principle of bird-flight has been acclaimed by aeronautical experts the world over. It has won Stolzenberger recognition as the only successful creator of flapping wing flight, an idea Leonardo Da Vinci thought of but never achieved. Serious consideration is being given toward building full-scale “Flappy’s,” using Stolzenberger’s principle of motivation to make them work. When he thought of the Flying Disc the papers were full of stories about the mysterious Flying Saucers. He took advantage of two points of timeliness: 1, the intrigue of a small disc that would zip through the air; and 2, the use of the gun. Toy pistols, probably because of television and the comeback of the western pictures, were more of a fad than ever. Stolzenberger’s version was a toy composed of a plastic pistol that fires a rubber band. The band, when fired, spins a disc shaped missile that looks like a flying saucer! Needless to say the novelty caught on. “Another trick,” Stolzenberger suggests, “is to take advantage of the mysterious. Create something that people can’t figure out.” That’s why his dancers came into being. He calls them the Toon-a-Loons. They are figurines cut from pasteboard, then placed on a circular diaphragm. When you hang the little diaphragm (dance floor) near the audio on the radio or TV set the sounds and vibrations make them dance to any tune. They will samba, rhumba, waltz or jitterbug. What makes them so intriguing is that no one, at first glance, can figure out how they work. Hence—take advantage of the mysterious. “The price wasn’t right,” says Stolzenberger. “When we got down to about 49c the curious wanted to buy and not just look.” Now Toon-a-Loons is being redesigned with an eye toward economy. Right now Stolzenberger is trying to figure out how to build that toy novelty radar set, television set, ray-gun, and other items which he believes are very much in demand. Very secretly, he’s also working on a 25c atom bomb. Don’t be surprised if he explodes one! Summing up, we learn several lessons from Stolzenberger’s success: Get a good idea—one that is timely; be sure the item is in the price bracket of the millions rather than the few; make it an impulse item rather than utilitarian; if you can make its actions mysterious, so much the better; then see that it is well but economically made. Simplify the design so the prospective manufacturer won’t feel there is too much expense involved in tooling up. And remember, it’s the idea people that make the quick profits.